Take our exclusive course to become your firm’s resident authority on our state of the art automation features. YES, I WANT TO BE AN EXPERT! 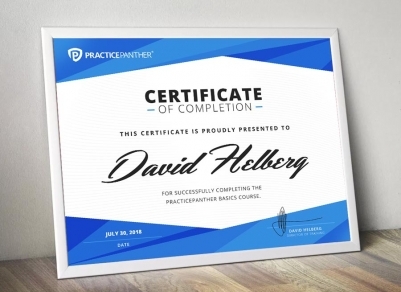 PracticePanther’s certification program is designed to help you make the most of our software. Learn the ins and outs of our features and integrations and be more efficient than ever before. ANSWER QUESTIONS BEFORE THEY'RE ASKED. Our course has been designed with your time in mind. Start, pause, come back to, and follow along with our intuitive guide to all things PracticePanther at your own pace, in your own time. No regimented or timed-out courses - just quick, simple lessons that are adaptable to your busy schedule. PracticePanther prides itself on intuitive, efficient law practice management software, and the process to become certified in it is no different. Simply click here, sign up, and get started on building your expertise today. Once you pass our end-of-class assessment, we’ll send you your very own PracticePanther certificate! + Who can do it? Anyone who’s interesting in becoming a PracticePanther expert. You, your paralegal, or anyone in the firm! + How long does it take? The certification process can take anywhere from as little to 3 hours, up to 8 hours, depending on how much experience you already have with PracticePanther. + How much will it cost? Our certification program is free of charge. + Can we do it anytime? Yes! Since we understand that you’re busy, so we built the course in a way that allows you to log in and out at your convenience to complete the various sections at your own pace. + What happens once we get certified? Upon completion, you’ll receive an official certification, and a badge for your website, LinkedIn profile or resume. + How do we get started? Just click on “Get your certification” on this page, and follow the instructions. + Is there a name for this certification program? + Why should we get certified? A. One person will be an expert in the firm. B. Independence to help everyone in the firm with anything need. C. Time - spending less time on certain back-end admin tasks. D. Saving time, means making more money. Help your firm get automated and powerfully productive by becoming the residential expert of your law practice. Get started today!